Just For Kids - this section of the website is devoted to kids interested in learning more about Doug Engelbart's life and work. "Douglas Engelbart can be credited with inventing much of the computing paradigm we all use today, but have we missed his most important ideas?" The man who sees the future, U.S. News - "Yet, all the brilliant things he has produced are mere baubles compared to the ideas he's trying to get across." Videos - Videography - links to the video collections of Doug's key talks, presentations, workshops, awards, and conferences available online. Complete Archives - visit the Engelbart Archive Collection, a portal into his photos, videos, texts, slides, demos, software, press coverage, historic events, stories, and more. Press Clippings - articles written by the press. Books - books that feature or mention Doug Engelbart. Video Interviews and Video Archives - links to videos of TV interviews with Doug Engelbart. 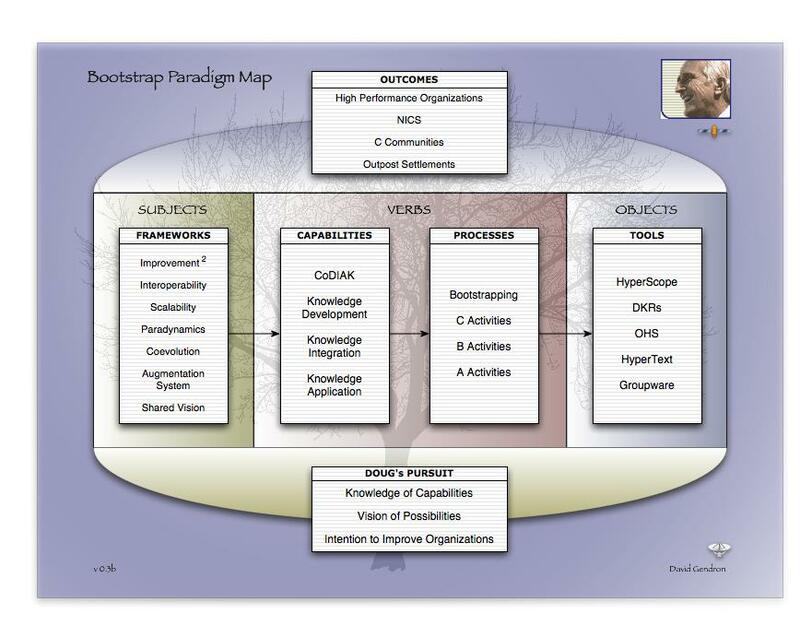 From David Gendron: a new take on the Bootstrap Paradigm Map. 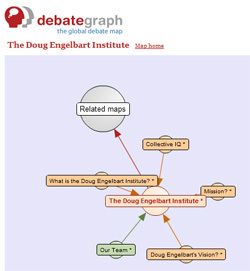 From David Price: Doug Engelbart Institute on Debate Graph. On the subject of Engelbart and Multimedia see artmuseum.net wonderful pages on Engelbart's Contribution to Multimedia, Creative Work, Writing, and role in the History of Multimedia.